Pat Garmhausen is November’s Artist of the Month! Pat is a 1979 graduate of Kent State University with a BFA in Graphic Design and Illustration. After her arts education, she worked in TV on Channel 43 in the 80’s, then at Imperial Home Decor as the graphics department art director. She has been a Cleveland Heights resident since the early 90’s and started her own business around the same time! Pat has been painting and creating garden inspired art and design for fine textiles and paper goods in her Etsy Shop, as well as here at Heights Arts! Many of her pieces that have garden imagery are based off from her own home garden. 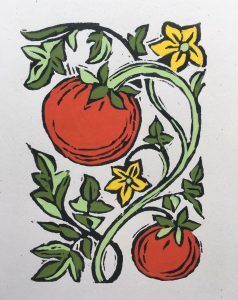 We are featuring her piece, “Tomato Block Print” (pictured left) as a piece of hers you have the chance to take home for FREE with the completion of our in-gallery raffle! Congratulations to October’s winner, Daven Holly on winning APEMADE’s baseball tee!